On Second Scoop: Ice Cream Reviews: KLONDIKE THE CANDY! 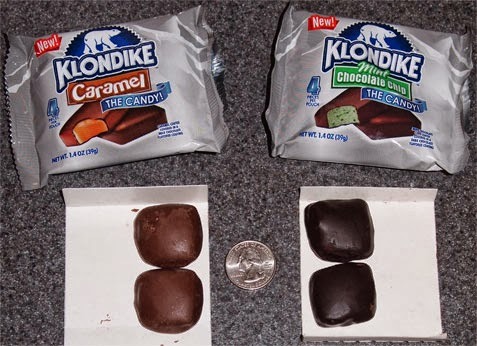 [New for 2013] Whether you've seen them on store shelves or maybe just seen a review online, you probably know by now that flix candy has created New KLONDIKE THE CANDY! Sorry, didn't mean to yell, just trying to relay the excitement that the packaging has for the new products. We've got Caramel and Mint Chocolate Chip versions, and I'll admit it, it's hard to resist the thought of Klondike flavored candy. Caramel is "caramel center covered in a milk chocolate flavored coating" while the mint one is "mint chocolate chip center covered in dark chocolate flavored coating". Each 1.4 oz pack contains 4 candies but unfortunately I thought to take this size comparison picture after I had already sampled both. Now you might be thinking to yourself "ummm, doesn't the mint version show chips inside?" and it does, but they're hiding. See, there are only a few per square so you don't really notice them visually or texturally. Oh, and no, it's not a gooey caramel as you can see. Now the mint version is my favorite of the two. It's a surprisingly dry filling with a mint flavor that reminds me of my grandmom's buttercream mints. Sweet, not too minty, little bit of... tingle I guess we'll say. Does it remind me of a klondike? not even a little. It doesn't even really remind me of a york peppermint patty. It's not bad, it's something fun to try and maybe share with someone, but I don't see a repeat purchase in my future (though I'd happily eat them if someone gave them to me). The caramel is kind of flat and ho hum. It's a generic rolo wannabe really. If it wasn't obvious to me before picking up these candies, this one really drives home the fact that these candies are made solely for name recognition and a quick buck. I mean, man are these boring. They have this kind of cheap, dry aftertaste to them. Granted, maybe these have sat on the shelf too long but the fact that both varieties are dry makes me think it's the just the way they are made. When there are four candies in front of you and you don't even want to bother finishing them, that's when you know it's a pretty bad candy. Ok, these aren't worth your time. Move along, nothing to see here. They doesn't look so good. Very expensive and I got the feeling that they will go on clearance shortly. They should had made gooey caramel. Seen these at a truck stop and thought why not. after trying them I was wondering why? They have a horrible after taste and like mentioned taste like chocolate that has sat too long. its a purchase I regret and wish I had not bought them. klondike name or not. yuck. I'm not sure anyone has properly conveyed how disgusting these are. If you want to try them just to find out for yourself...do it. They're gross...The mint had almost a metalic flavor that made me immediately spit it out. The aftertaste stuck around for a LONG time. Just disgusting...makes me want to gag thinking about it.